The parade included the Eagle Cornet Band, International Order of Good Templars, the Amateur Brass Band, St. Bridget Temperance and Benevolent Society, and town officials. A Revolutionary War cannon was borrowed from Concord. The Treasurer's Report recorded $13.50 spent on gunpowder. Amory Maynard and Lorenzo Maynard on the hill south of the mill. Prior to the date, Assabet Village, as the hamlet was known, was a fast-growing mill town straddling the Assabet River, which was also the border between Sudbury and Stow. These ‘parent’ towns had been against the idea, as the proposed new town would take roughly 50 percent of their populations. Stow residents circulated three petitions which garnered about 140 signatures. Sudbury held a vote at Town Meeting, 183 against and 88 for. In disregard of this opposition (and perhaps influenced by some undocumented lobbying), the request to form a new town was granted. Some solace was achieved by Maynard making payments to the towns seceded from. A note here on the 'founders' of Maynard. Histories of the town list as founder the 71 men who signed a petition dated January 26, 1871. There is more history behind this history. Months earlier there had been a petition with 68 signees to create a town, name not yet selected, to encompass small parts of Acton and Concord in addition to larger portions of Sudbury and Stow. This was never submitted to the state legislature. The second petition gave up annexing the gunpowder mill land from the first two towns. William Knight started the woolen mill in 1846. Milestone anniversaries have been celebrated in various ways. The 50th anniversary was a huge event. According to the program, church observances on Sunday, April 17th, school observances on Monday, and on Tuesday morning a 50-gun salute and a parade of an estimated 1,000 people down Main, Nason and Summer Streets. Speeches by Governor Cox and Senator Gibbs followed. Local veterans of the Civil War (! ), Spanish-American War and the Great War participated. Afternoon activities included Glee Club and choir singing, a band concert and ball game - Maynard versus Concord - at Crowe Park. Likewise, the 100th anniversary was a huge event. Huge. Celebration was pushed to June (perhaps in hope of better weather). Ten days of celebrations included picnics, concerts and performances, capped by a parade and fireworks on July 4th. The 125th anniversary celebration, in 1996, appears to have been a subdued affair. The Maynard Historical Committee published a collection of essays on town history. One puzzle: there are photos of the Olympic Torch being carried through Maynard by a young runner. It turns out that the torch was in Massachusetts on June 15th to be relayed along the entire route of the Boston Marathon, and while in the state, visited many other towns, including Maynard and Stow. 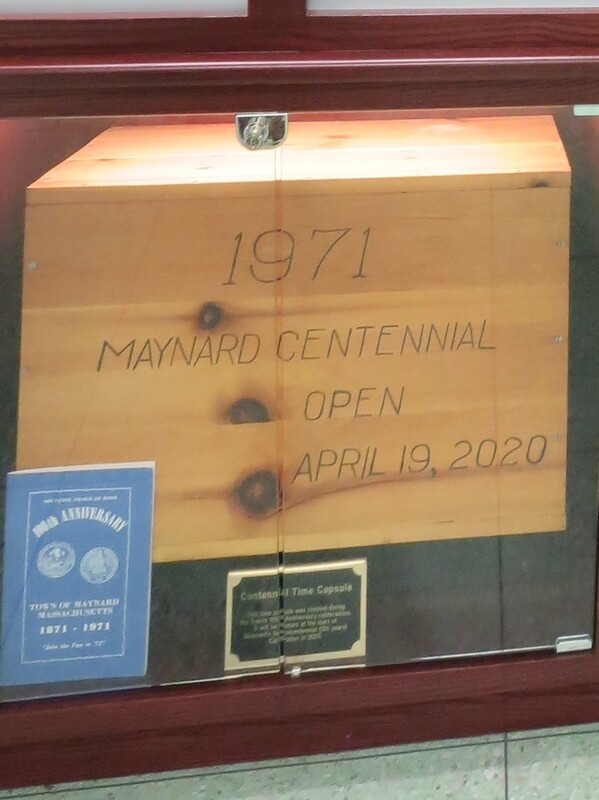 Looking futureward, hold this date, as the Town of Maynard is planning several events to celebrate its sesquicentennial (150th) anniversary celebration. 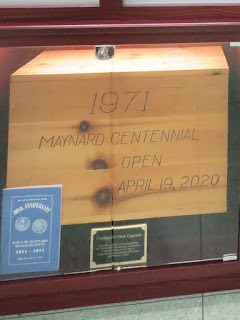 Events will start with the opening of a 1971 Time Capsule (actually, a box) currently on display in Town Hall.